Kashmiris are known as meat lovers in our region and of all the meat variety mutton/lamb is their favourite. Harissa or Hareesa is a traditional Kashmiri dish prepared with basically slow cooked meat, spinach and lentils, rice or wheat is added to the stew. The whole thing is usually cooked overnight over very low heat till all ingredients blend into one big simmering pot of comfort. In the morning Kashmiris have this for breakfast with crisp kulcha or naan(flatbread)to energise the body and prepare for the day ahead. Especially in winters, waking up to this hearty breakfast is a soul warming experience. This dish shows the Central Asian influence on Kashmiri culture. It’s not to be mixed with the Tunisian peppers paste of the same name. I owe this recipe to a good family friend, she was a Kashmiri, a splendid cook herself and very generous to share her family recipe of Harissa with me. My elder daughter is a huge fan of Kashmiri Harissa, so much that she requests for it even for her birthdays. It’s great for a lazy Sunday brunch and big family gatherings as it can be prepared a day ahead and easily frozen. Outside Kashmir the chicken and beef versions of the dish are also quite popular. Seekh kebabs and caramelised onions are added on top which make it quite an indulgence. I’ve modified the recipe a little to make it quicker and replaced the ghee or butter with olive oil.Its a stew you don’t want to miss, specially when you are craving comfort. In a large saucepan caramelize two onions. Add meat, chopped ginger and garlic. Turn the heat to low, add 7 cups of water, cinnamon sticks and coriander. Cover and let the broth simmer for half an hour, then add the lentils, ground chili, garam masala and salt. let it simmer for another 40 minutes or till the lentils and meat are well done. Add the spinach, cook another 10 minutes. Turn off the heat, let the stew cool down, scoop out the cinnamon sticks. When the stew is cool, spoon it into a food processor and blend it till all the ingredients become one. Pour it back into the pan and cook over low heat. Dissolve 3 tablespoons of wheat flour in 3/4 cup water. Slowly pour the flour in the Harissa pan while stirring continuously. Cover the pan and let it simmer till the flour thickens the stew a little and binds it all together in a Haleem like consistency. 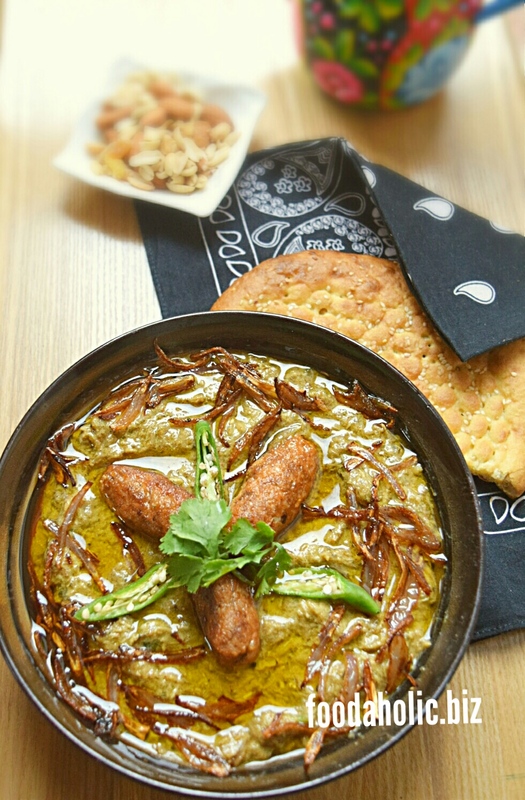 Traditionally, Hareesa is served with kebabs and crisp fried onions as garnishing. For Seekh Kebabs, add all the ingredients of kebabs into a food processor, blend for 1 minute. Make really tiny kebabs (the size of your little finger). Heat oil in a medium frying pan on medium-low heat. Drop kebabs in, fry on all side. They are so tiny that they will get done in a jiffy. Spoon out Harissa in a serving bowl or individual deep plates, top with kebabs and fried onions. Tip: Using a pressure cooker to make the stew would cut the cooking time in half. This concept is completely new to me. When I was looking at a picture, I wonder why what’s underneath (Kashmiri Harissa) is doughy, but it’s blended! Topped with kebabs, the double meat dish will surely be hearty. Thank you for the inspiration!